It’s hard to be an analyst and not be a fan of Nate Silver. Actually, I think it might actually be the law — one of those “natural law” things, like gravity (“Obey gravity! It’s the law!”), rather than one of those legislated ones. Not too long ago, I wrote a post that gave my take on one aspect of the post-election commentary about Silver’s work. In some of the Twitter exchanges around that post, Jim Cain suggested that I really should read Silver’s book, as the content of the post lined up well with some of the topics Silver covered. I’d planned to read the book over the holidays, anyway, but his nudge convinced me to go ahead and buy the Kindle edition and bump it up to the top of my list. The instinctual shortcut that we take when we have “too much information” is to engage with it selectively, picking out the parts we like and ignoring the remainder, making allies with those who have made the same choices and enemies with the rest. The numbers have no way of speaking for themselves. We speak for them. We imbue them with meaning…Data-driven predictions can succeed–and they can fail. It is when we deny our role in the process that the odds of failure rise. Before we demand more of our data, we need to demand more of ourselves. We can never make perfectly objective predictions. They will always be tainted by our subjective point of view. 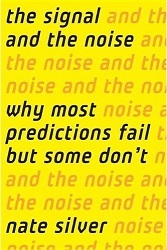 This is why our predictions may be more prone to failure in the era of Big Data. As there is an exponential increase in the amount of available information, there is likewise an exponential increase in the number of hypotheses to investigate. For instance, the U.S. government now publishes data on about 45,000 economic statistics. If you want to test for relationships between all combinations of two pairs of these statistics–is there a causal relationship between the bank prime loan rate and the unemployment rate in Alabama?–that gives you literally one billion hypotheses to test. But the number of meaningful relationships in the data–those that speak to causality rather than correlation and testify to how the world really works–is orders of magnitude smaller. Nor is it likely to be increasing at nearly so fast a rate as the information itself; there isn’t any more truth in the world than there was before the internet or the printing press. Most of the data is just noise, as most of the universe is filled with empty space. …I’m of the view that we can never achieve perfect objectivity, rationality, or accuracy in our beliefs. Instead, we can strive to be less subjective, less irrational, and less wrong. Making predictions based on our beliefs is the best (and perhaps even only) way to test ourselves. If objectivity is the concern for a greater truth beyond our personal circumstances, and prediction is the best way to examine how closely aligned our personal perceptions are with that greater truth, the most objective among us are those who make the most accurate predictions. It would be nice if we could just plug data into a statistical model, crunch the numbers, and take for granted that it was a good representation of the real world. Under some conditions, especially in data-rich fields like baseball, that assumption is fairly close to being correct. In many other cases, a failure to think carefully about causality will lead us up blind alleys. In science, one rarely sees all the data point toward one precise conclusion. Real data is noisy–even if the theory is perfect, the strength of the signal will vary. Prediction is difficult for us for the same reason that it is so important: it is where objective and subjective reality intersect. Distinguishing the signal from the noise requires both scientific knowledge and self-knowledge: the serenity to accept the things we cannot predict, the courage to predict the things we can, and the wisdom to know the difference. These were a sample of some of the passages I highlighted throughout the book. They capture a degree of the concepts and ideas that the book covers. They don’t — at all — cover the deeply researched examples that Silver uses to illustrate these ideas. From poker to election prediction to weather forecasting (which has gotten much better in the past few decades) to earthquake and financial market prediction (that have barely improved at all when compared to weather forecasting) to predicting terrorism, the depth and breadth of his research is impressive! I suspect I will be returning to specific aspects of his book in greater detail in the future, but this was a fun re-skim to remind me that the writing and ideas were both outstanding!